I’ve said I was looking for it, and I’ve found it! I was browsing through a local sales apps on my iPhone when I found a listing for the Indiana Jones Steamer Liner, upon which I made an offer to purchase the item. 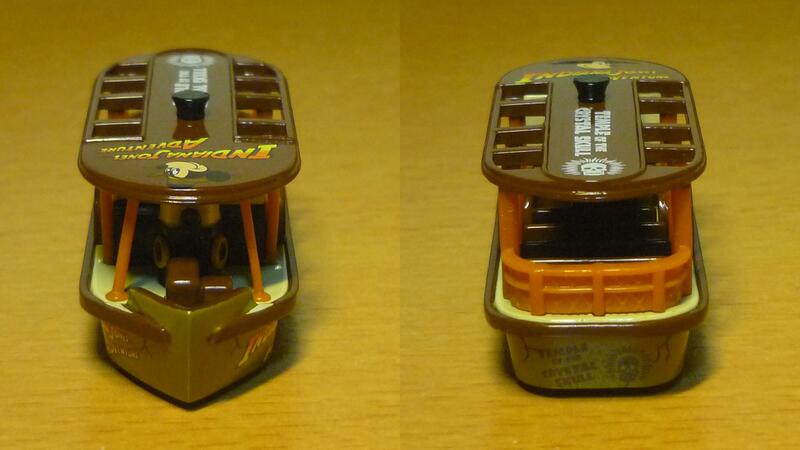 I had previously searched for the Steamer Liner at toy shops and departmental stores but have yet to find it on sale. After my purchase offer was accepted, I paid a visit to the seller’s toy base to collect the item, I’ll go a little bit more into that later. 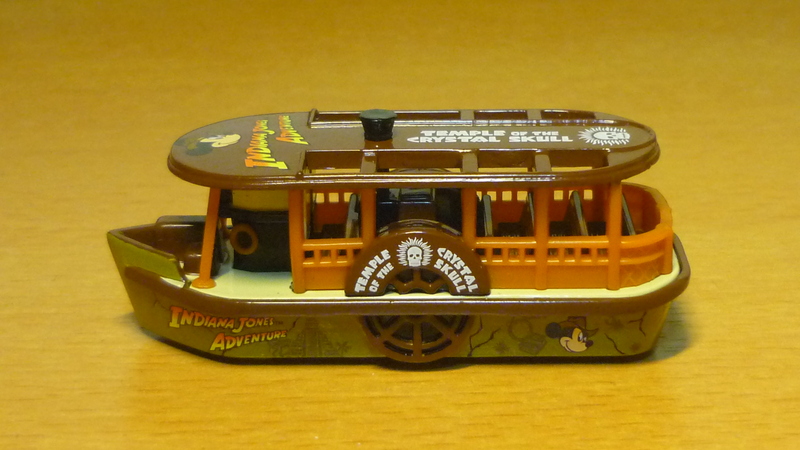 But first, let’s take a look at the Indiana Jones Steamer Liner. 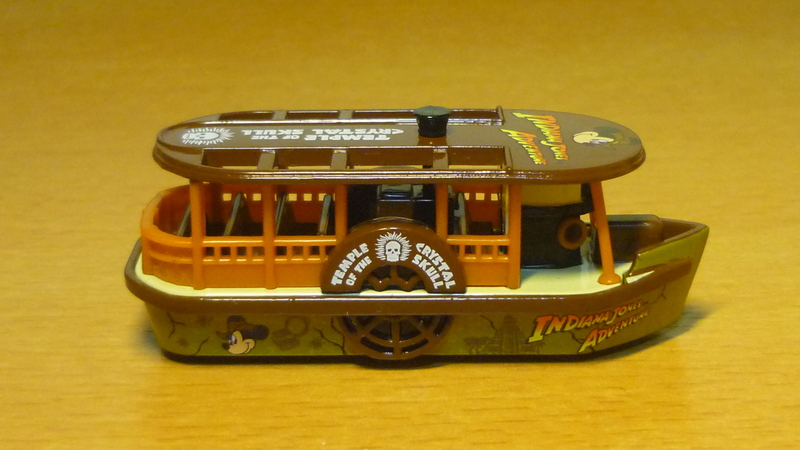 The Indiana Jones Steamer Liner is covered with the logo for “Indiana Jones Adventure: Temple of the Crystal Skull”, which is a dark ride attraction at Tokyo DisneySea, which apparently has a steamer liner in service there. On the Steamer Liner you can also see Mickey Mouse, who’s wearing Indy’s fedora hat. 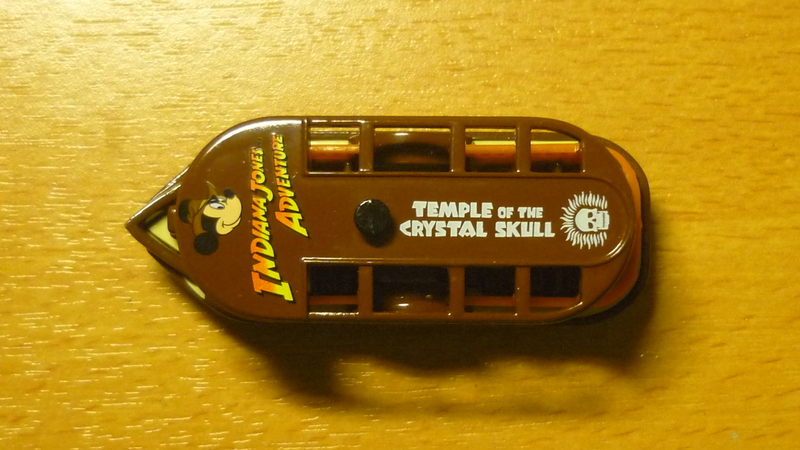 Apart from references to the crystal skull, the “Temple of the Crystal Skull” dark ride has no relation to the film “Indiana Jones and the Kingdom of the Crystal Skull”, the ride was developed much earlier and it premiered back in 1995 at Disneyland Park in Anaheim, California, with another identical version of the ride opening in 2001 at Tokyo DisneySea. KOTCS itself was released in 2008. Bow and aft view: Those circular things on the steamer liner, I think they are life preservers. Top view: One obvious difference between TOTCS and KOTCS is that the crystal skull in TOTCS looks more human, whereas the crystal skull in KOTCS is more elongated and alien-looking. Oops, spoiler alert! 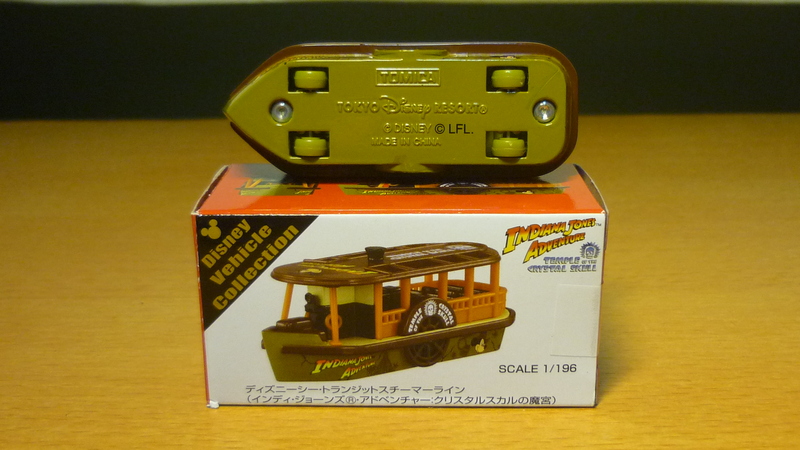 The bottom view of the Steamer Liner shows that it run on wheels. 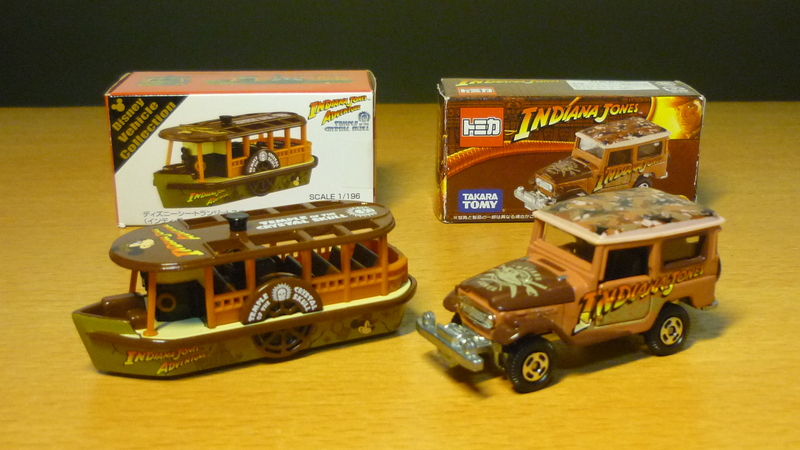 The 1/196 scale die cast Indiana Jones Steamer Liner was released by Takara Tomy in 2014, but I haven’t come across it at departmental stores. 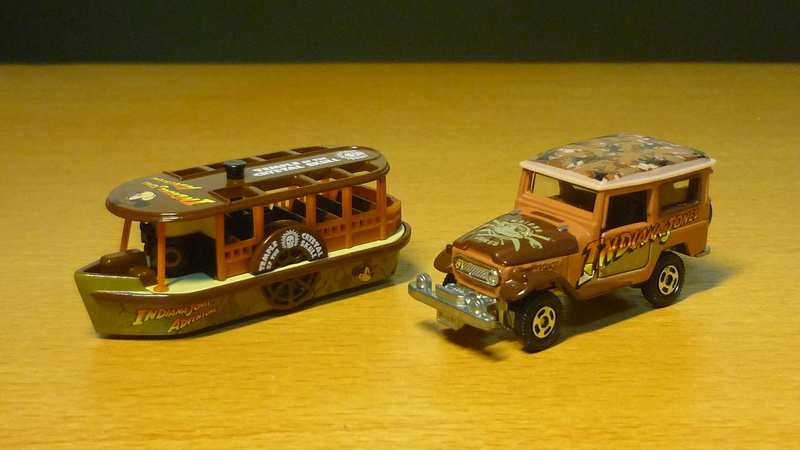 Indiana Jones theme vehicles: The steamer liner, and the Land Cruiser. 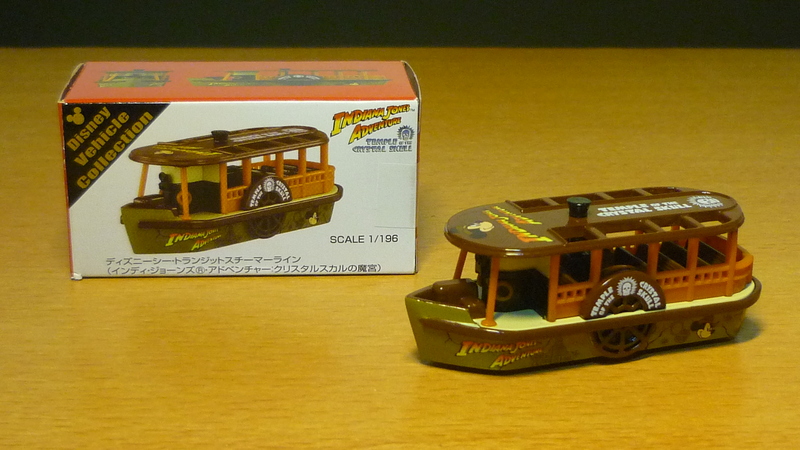 The Indiana Jones Steamer Liner obviously is a promotion of the Indiana Jones Adventure: TOTCS dark ride at Tokyo DisneySea, which seems quite apt especially since Disney acquired Lucasfilm. Regarding the seller, I’ll just say that it was quite an experience to take a look around his office/toy base, which houses not only the items on sale, as well as what I assume are his personal collections. This include Power Rangers toys, and a couple of other vintage items. And it’s not everyday that you can get to see a USS Flagg on display.